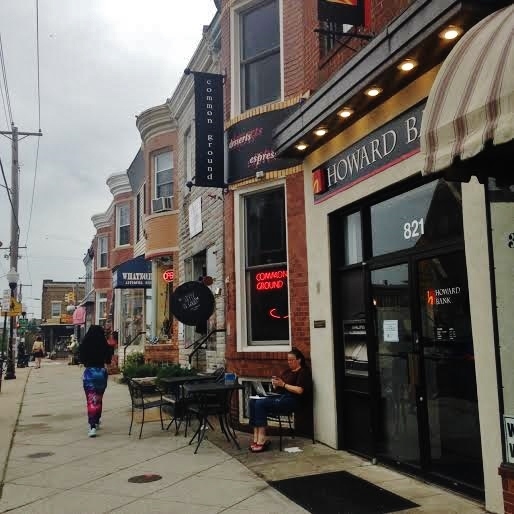 Baltimore, like any great city, is home to many quality independent coffee shops. During the past several weeks, Baltimore Post-Examiner has scoured the city in search of the best shops to meet with friends, do some work, or just relax. During our caffeine-fueled mission, we paid special attention to atmosphere, friendliness, taste and variety in menu items to arrange a list of the best places to chill out with a delicious beverage, snack, or both! This two-story cafe, at the corner of E. Fort Ave. and Webster St. in Riverside, is a bright, warm oasis in a desert of concrete. The first floor is an inviting cafe, serving coffee and espresso drinks, smoothies, and a wide variety of loose-leaf teas for modest prices. If you’re hungry, Koba also offers bagels, salads, sandwiches, quesadillas (which, at about $6, are a good size and very tasty), pastries and more. 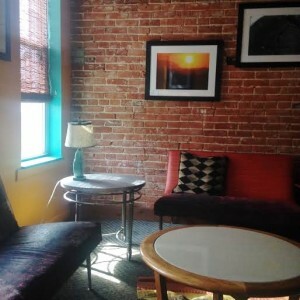 The cafe has a tropical vibe, with paintings of animals and nature-inspired decor accenting the brick walls, and upbeat, multicultural music that could lift even the dampest of spirits. Upstairs, where one long room is filled with tables and all types of charismatic chairs and couches, is quite the contrast. The peaceful, quiet atmosphere is enhanced with patterned throw pillows, rugs, lazy ceiling fans and tons of natural light. In the back is a tiny conference room with a table, chairs and a bookshelf stocked with varying genres, providing a great area for meetings or some private reading space. The friendly service and atmospheric options at Koba Cafe make it the perfect place to chat, work, or unwind comfortably. The good coffee, good food and good prices don’t hurt, either. This roomy, high-ceiling shop is nothing if not unique. The Bun Shop offers a wide variety of inventive coffee and tea drinks (such as iced green tea made with real, bright matcha or aloe lemonade). And, as its name suggests, the cafe’s menu also features pastries, savory and sweet, from all over the world. Fancy a salty pork bun, a pumpkin pasty and a sweet Vietnamese coffee in the same sitting? Then, the Bun Shop is the place for you. 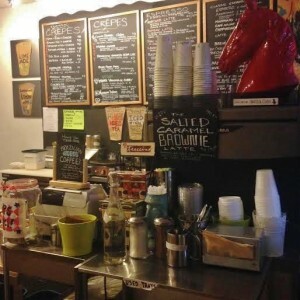 Even more intriguing than the cafe’s eclectic menu is its eccentric atmosphere, which sets it far apart from any other coffee shop in the area. Within the darkly-painted brick walls is a vibe that lies somewhere between hipster, Steampunk and Victorian apothecary. Sound weird? You have to see it for yourself. The spacious shop is serenely-lit and decorated with ornate, ancient-looking furniture, a baby-grand piano, and glassware that appears to have passed through a time machine from the 1800s. In the dim light, it’s hard to tell what fancy, old coffee machines are in use from what’s just on display, which only adds to the shop’s time-bending charm. Even after 10 p.m., the cafe is full of people staring at laptops or talking with friends. Seating at the Bun Shop is plentiful, with a long, almost medieval-looking table with benches, many smaller tables, and several cushy couches surrounded by with low-hanging lights, antique candle holders and huge potted plants. During our visit, the sounds of slow, new-agey music (think modern Enya) draped gently over the murmur of the crowd, creating an almost comically soothing atmosphere. We could’ve stayed sunk into the large sofa all night. No, really- we could’ve. Open until 3am all week, The Bun Shop is a great spot for work or leisure no matter the time of day (they even offer a big stack of board games). And, with its classic, romantic ambiance, this B.Y.O.B hangout would make for a perfect casual date spot. Overlooking the Harbor from Fells Point’s historic Thames St., Daily Grind is all you could want in a busy city coffee shop. The inviting smell of roasted beans, the hiss of steaming milk and the sounds of early rock and roll welcome you warmly, even before the pleasant staff have time to. The menu- a rainbow of chalk on a huge, high blackboard behind the counter- boasts a large variety of reasonably-priced coffee, espresso and tea beverages. They offer more than a dozen coffee flavors and about 20 teas to choose from, as well as a list of alluring “Barista Specialties,” like White Russian and Ferrero Rocher-inspired drinks. The menu also features snacks like bagels, muffins and sandwiches ($4-7), and on the counter, gourmet-looking candies are charmingly presented in glass jars, next to an array of cookies, rich, fudgy brownies and more. 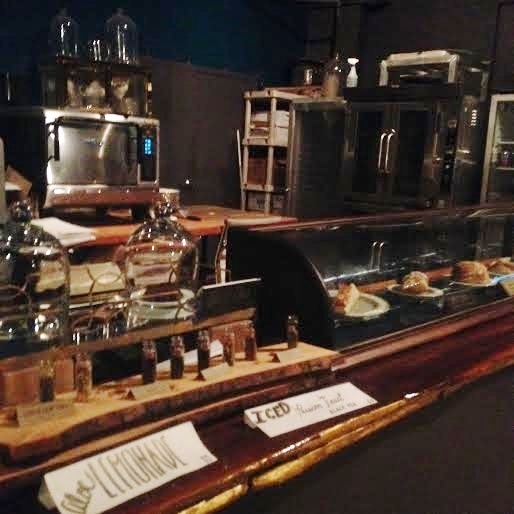 The coffee at Daily Grind is smooth, and the atmosphere marries industrial and cozy with its bookshelves to borrow from, hardwood floors, brick walls and visible ceiling pipes. Beyond the main cafe (which displays plenty of Baltimore-themed photography), the long, narrow shop is divided into several small “rooms,” each with a couple of tables, allowing just enough privacy and quiet for the many customers working and studying. Our only complaint at Daily Grind is Fells Point’s notoriously difficult parking situation. 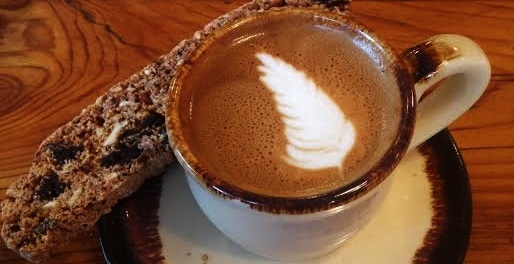 But, with the shop’s warm, casual atmosphere, pleasant service and delicious treats, it’s a must for anyone in the area looking for a great cup of coffee. Plus, it’s in a great location for people watching or taking in some history. Located just next door to the Ma Petite Shoe boutique on The Avenue in Hampden, this intimate, Parisian-accented cafe is about as charming as Charm City has to offer. Though tiny even when empty, Ma Petite makes up for its size not only with the quality of its offerings, but with the exciting, non-traditional ingredients and flavors they infuse them with. The cafe’s white-chalked menu features sweet and savory crepes, which average about $8. Along with classic fillings like cheese and chocolate, Ma Petite offers several bold options such as tiramisu, pork belly, lox and curry. Coffee, espresso and teas average around $5. In addition to all of the basics (mochas, machiattos, etc. ), Ma Petite shakes things up a bit with unique flavor blends. For example, they offer a tantalizing selection of lattes with flavors like horchata, Mounds bar and lavender, which is made with homemade lavender simple syrup, and is absolutely delicious. like basil limeade and hibiscus iced tea, as well as savory tea blends like carrot-curry and tomato-mint. And, if you’re craving something small and sweet, there’s a selection of Italian truffles, large cookies and other treats displayed attractively on the counter. Whimsical decor like tiny Eiffel Towers pairs with the cafe’s indulgent menu to create an atmosphere that’s both relaxed and a little fancy. The music (when we visited, synth-rock like MGMT) is quiet, and blends organically into the background with the sounds of sizzling crepes. If you’re visiting with a group, there’s some extra seating upstairs, where a few small tables sit in a bay-windowed room with a cart full of magazines, nature books and toys to keep the kids entertained while you savor and socialize. The best thing about Ma Petite Shoe Cafe, with its pleasant service and unmistakable ambiance of an old Baltimore row house, is that you’ll feel right at home. Though, the lavender latte is a close second. In all of our journeys to find the best coffee shops in Baltimore, we failed to discover anywhere as laid-back, inviting and simplistically tasty as Common Ground Cafe & Coffee in Hampden. Just across The Avenue from Ma Petite Shoe, This cafe’s perfect combination of mellow atmosphere, bright service and a mouthwatering menu make it our favorite spot for mingling, working, eating or sipping. The coffee and espresso selection, while not quite as adventurous as some other shops, is certainly more affordable than most (the highest price listed is $5, for a 20oz cafe mocha). And, most importantly, the drinks we sampled were the tastiest we’ve found. The coffee, black and hot or sweetened and iced, was very, very smooth. The chai latte was an absolute knock-out- thick, rich, and warmly spiced, but not too sweet. It almost earned this shop its “number one” spot, all on its own. Other beverages at Common Ground include smoothies, frappes, several unique tea blends, Italian sodas and even bottled kombucha. 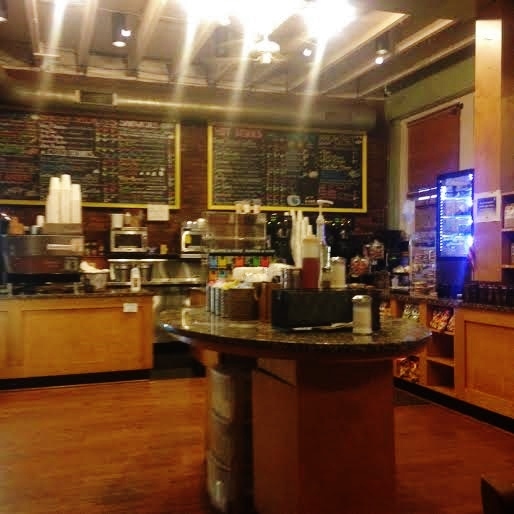 The cafe also offers a sprawling list of sweet baked goods, bagels, breakfast sandwiches, paninis, quiches, and more, with tons of ingredients and flavors to choose from (we had a bagel, perfectly toasted, with no shortage of thick, zingy veggie cream cheese). The music, mostly 90’s alternative rock during our visit, sets a casual, slightly edgy tone that’s “hip,” but not repellently. The two girls behind the counter were spirited, funny, and ready to answer any questions about the menu. Seating at Common Ground is limited, but not severely. Several tables sit in the gently-lit cafe area up front, where a few patrons stare intently at their laptops amid walls accented with brick and rich, homey wood. Past the tiny counter area, through a narrow hallway with a bright, flowery mural, is a small room with a handful of additional tables, bright green walls and a small, quirky chandelier. This room opens up to an outdoor patio, where the swirling mural continues onto the brick. The final ingredient that makes Common Ground Cafe & Coffee our favorite pick of the bunch is its notable, refreshing lack of pretension. You’ll feel totally welcome, you’ll eat and drink well, and you won’t break the bank. Any one of these cafes would be a good choice for both work and leisure. Each offer free Wi-Fi along with their characteristic atmospheres and delicious menus, and we particularly loved that most display lots of local art for sale. Though these five cafes were our favorites, they’re by no means the only great coffee spots in the city. Some that we tried didn’t live up to our expectations (not very friendly, so hot inside we had to escape before we could order, listed a $15 espresso drink, bland food, etc.). But, two that just missed a spot on the list are Pitango Gelato in Fells Point (very good espresso, with a bonus- 20 inventive flavors of Italian gelato and sorbet) and Peace & a Cup of Joe on W. Pratt St. (great service, tons of local art, a weekly open-mic and complementary beer and wine with meals after 3pm). Did we miss a great place? We’d love to hear about your favorite spots to grab coffee in Baltimore! Karma Cafe off St. Paul on 32nd, small but very comfy. Great breakfast sandwich. Oh and I forgot to mention Atwater’s in Belvedere. Probably the best cortado in the city. Interesting they made the feature photo but not your list! !